Can I Charge a Store for My Emergency Dentist? I was at a store and grabbing an item when something fell from their top shelf and hit me in the mouth. I started bleeding and the manager was very apologetic. At the time I didn’t think anything was wrong with my teeth, but today one of my front teeth seems to be getting darker. What do I do? If I have to go to an emergency dentist will they bill the store? I’m sorry this happened to you. What you’ll need to do is contact the store manager and tell him or her what’s going on. It’s very likely they’ll be willing to pay the bill. Don’t put off getting treatment though. The darkening color is likely a gray color which means your tooth is either dead or dying. You will need to get a root canal treatment and a dental crown. If you wait, you could lose the tooth. that will mean an extraction and tooth replacement. It’s much simpler (and less expensive) to repair a tooth than to replace it. Who Pays for an Emergency Dentist? As to who pays, unless the manager lets the emergency dentist know to bill the store he can only bill the person receiving the treatment. That doesn’t mean you can’t send them the bill if you have an agreement with them. Just be aware that you’re the one responsible for it. If for some reason the store manager decides he’s not going to pay the bill you have a couple of choices. First, you could take them to court. Just be certain you get treatment in a timely manner. The court system will only charge the defendant for the initial treatment needed as a result of the accident. They won’t cover additional treatment required because you put off treatment. A second option is to make a PR fuss. Call your local news station and let them know what happened. They may pay the bill to avoid the bad publicity. Because it’s a front tooth which was injured, you want to be careful what type of crown you have placed. Many dentists will place porcelain-fused-to-metal crowns no matter where the tooth is located. That is a mistake. 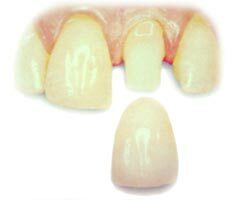 Metal-based crowns are more opaque looking than your natural teeth. Plus, they all eventually develop a gray line at your gum line, which will be remarkably unattractive. You’ll want to make sure whichever dentist you go to gives you an all-porcelain crown. They look much more natural and you’ll never have to worry about anything peeking out from your gums.